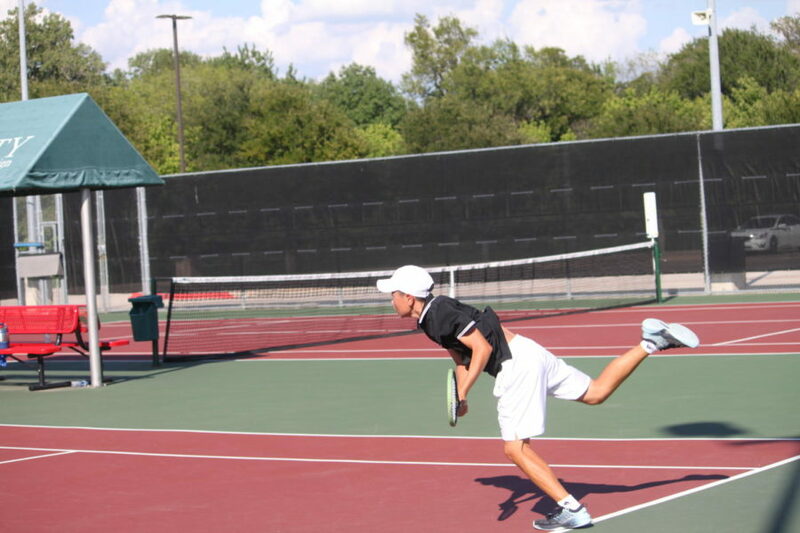 Coppell High School junior Mihiro Suzuki returns the last shot of his doubles match with Coppell High School freshman Andreja Zrnic against Marcus High School on September 18. Suzuki and Zrnic lost 8-6 while the team overall won 12-7. 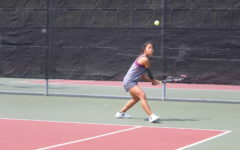 After an intense and nerve-racking match, the Coppell varsity tennis team took a 12-7 win against Marcus yesterday on its home courts, maintaining its perfect district record. Going in to the match, it was apparent defeating Marcus would be more difficult than dominating many other district teams has been for Coppell. Prior to Tuesday, the Marauders were undefeated this season. Particularly on the girls side, players from both teams had comparable UTR (Universal Tennis Rating) levels. Although the final score may not sound close to some, if Marcus had snatched just three more matches, it would have won 10-9. 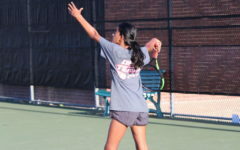 Junior Aishwarya Kannan and sophomore Rishita Uppuluri’s doubles match was key to Coppell’s victory. 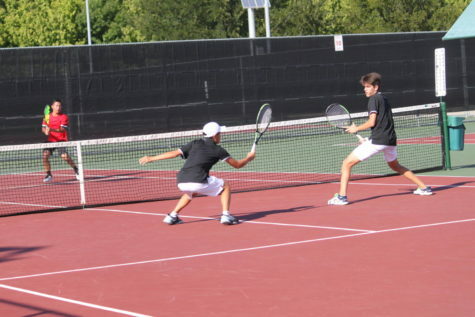 Because the pair won their tiebreaker, and in turn their match, their team won 5-2 in doubles instead of 4-3. Coppell High School varsity tennis player junior Mihiro Suzuki and freshman Andreja Zrnic dive to hit the ball during their second set against Marcus High School on September 18. Suzuki and Zrnic lost 8-6 while the team overall won 12-7. Throughout the beginning of the season, the team has been experimenting with the its doubles lineup, striving to find the most powerful combinations. Although doubles partners have solidified for over three weeks now, Foster made a last-minute change for yesterday’s match after seeing Marcus’s pairs. Even though the team played well, there are still areas for improvement. Furthermore, often, when the game got close, Coppell players would tighten up, and change their style of playing. Because of their win yesterday, Coppell tennis has taken another step toward its goal of seizing in a good spot in playoffs. The team will face off against Allen at its home courts this Friday.